It's 6 am and I'm getting ready for BlogHer 12. In case you missed it on Facebook, Twitter and Pinterest yesterday I announced some pretty BIG blog news. Ellen Seidman, blog writer extraordinaire, asked me (ME!) to guest post a weekly series on one of her Parents.com blog To The Max. The weekly (Wednesday) series is called, Autism Hopes. And my first post went live yesterday. Prior to the diagnosis, I knew very little about children with autism. And I knew even less about the parents who raised them. There wasn’t a single parent I could turn to for advice or support. But in these last four years, I’ve met so many inspiring moms and dads with kids on the spectrum. And I’ve learned just as much from them as I have from Norrin. 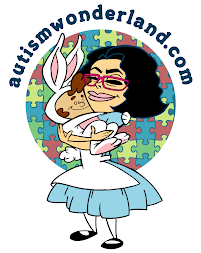 So what are the 5 things about an autism parent? Click HERE to find out. Hope you like my first post and would love to hear your thoughts. Congratulations, Lisa! Of course, I missed all the announcements, yesterday. Keep doing what you're doing. Wishing I were with you at BlogHer. HAVE FUN.